Ready to get started on Pinterest? Grab my Free Pinterest Start-Up Guide! Shopify is a powerful platform for e-commerce. Using some basic Pinterest marketing strategies, I’m sharing how to promote your Shopify shop on Pinterest. This post may contain affiliate links, which means if you make a purchase from my link I may make a small commission at no cost to you. Are you using Pinterest to promote your Shopify shop? The two go together like peanut butter and jelly! Shopify has made it easier than ever to add your physical product pins to Pinterest to become buyable. It’s a match made in heaven, but how do you drive traffic to your Shopify shop using Pinterest? Blog about your products, at least monthly, but weekly if possible. Blogging allows you to create new fresh content that Pinterest loves. Show how you can use your product. Display it in a lifestyle post about how it is practical for your niche audience, or share a collection of items that group well together. Lead them to your funnel using a coupon or opt-in freebie immediately when they land on the shop. By collecting their email, you can reach out to window shoppers and send them relevant promotions and coupons. Maintain and curate an active Pinterest profile and optimize your account for clicks. If you aren’t sure how to do this, you can grab my Free Pinterest Start-Up Guide. Curate boards and pins that are similar or related to your shop items. Use a scheduler, like Tailwind to stay consistent. Pinterest prioritizes accounts that are actively maintained. In fact, they prefer accounts that pin a few times a day versus ‘binge pinning’ once a week. 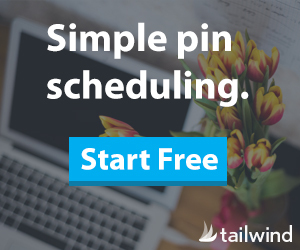 Set a reminder to live pin daily or use a scheduler like Tailwind to maintain a robust Pinterest account. Want a little peek into a brand new Shopify shop relying on Pinterest for traffic? I helped managed this shop using Pinterest and Tailwind, of course, to grow traffic, email, and ultimately sales! This traffic and shop really started to take off with peaks of virality and consistent traffic. Pinterest is a powerful place to promote your Shopify shop! With active pinners looking for amazing new products to fit their lifestyle or needs, grow your customer leads by driving traffic from Pinterest. Are you new to Pinterest and want more tips to get started? See my introductory post Getting Started on Pinterest and don’t forget to sign up for my email newsletter below. You’ll receive my FREE Pinterest Start-up Guide for your creative small business where I give easy actionable steps to getting started on Pinterest! If you enjoyed that, I’d love for you to follow me on Pinterest and don’t forget to pin it! Sign-up for my newsletter and get a FREE Pinterest Start-Up Guide for your small business! « Are you making these 3 common mistakes on Pinterest? Want to hear from me more? When is the best time to pin on Pinterest? Is your creative business legally protected?